Doug Marrone started out as an offensive lineman but now functions as the head coach of the Jacksonville Jaguars, of the NFL (National Football League). He was also the Director of Football Operations at “Georgia Tech” and once worked with the “New Orleans Saints” as an offensive coordinator between 2006 and 2008. Moreso, he once served as the head coach at Syracuse University from 2009 to 2012 being the first “Syracuse alumnus” to be the head football coach in the university since Reaves H. Baysinger in 1948. Having coached the likes of running back CJ Spiller in the Buffalo Bills and worked under the likes of Herm Edwards, Sean Payton, Gus Bradley, it’s no surprise to see he is ranked as one of the best football coaches alive. Doug Marrone was born Douglas Charles Marrone on the 25th of July 1964. Not much is known about his childhood and family but the fact that he is of Italian ancestry is clear. Though he was born in The Bronx, he went on to become a three-year letterman at Syracuse University, where he played football from 1983-1985 as an offensive lineman. He then left Syracuse to play on the Miami Dolphins’ team in 1987 and later with the New Orleans Saints in 1989. He was also on the London Monarchs team of the World League. In 1991, he came back to Syracuse University and graduated. He began his coaching career in Cortland State as tight ends coach and also worked with Coast Guard in 1993 as offensive line coach. He went over to Northeastern in 1994 to hold the same position. Doug Marrone served in Georgia Tech from 1996 through to 2000 as both tight ends coach and offensive line coach. He was in Tennessee (2001) as tight ends coach and offensive tackles coach after which he worked with the New York Jets from 2002 to 2005 as offensive line coach and on he went again to the New Orleans Saints in 2006 as offensive coordinator and stayed there till 2008. On the 11th of December 2008, Doug was announced as Syracuse University’s head football coach just after the 2008 season. During Doug’s first season with the Oranges, they finished with four wins, one more than the previous year. They then doubled that output the following season, making that year (2010), the year with the most wins for them since 2001. That season had so many highlights including a victory over Kansas State and in the first-ever Pinstripe Bowl in New York City. This marked the Oranges’ first bowl win since 2001. In 2011, they started out with a 5–2, including a win over the West Virginia Mountaineers. However, they failed to win another game in the season, resulting in a 5–7 record. In 2012, Doug coached the Oranges to an 8-5 record, and also got a share of the Big East title as a result of a four-way tie. They then defeated the West Virginia Mountaineers again in a 38-14 victory in the Pinstripe Bowl. On January 6, 2013, he got selected as the successor of the Buffalo Bills’ former head coach Chan Gailey. Doug managed to get an overall record of 15–17 during his stay as head coach. It was also a time when “Saint Doug” became his official nickname and this was because he believed that getting a victory at Buffalo and getting another at Syracuse were two miracles that occurred in his career. He likened this to his belief that to become canonized as a saint, two visible miracles had to occur. In the year 2014, the Bills ended with a record of 9–7 and also came second place in the AFC East and were two wins shy from making the playoffs. This also marked the Bills’ first winning season in 10 years. Though at the end of the 2014 season, it was revealed that Doug had a three-day out clause in his contract in the event of an ownership change which he chose to exercise and so, on December 31, 2014, he quit and still collected his 2015 salary in full. 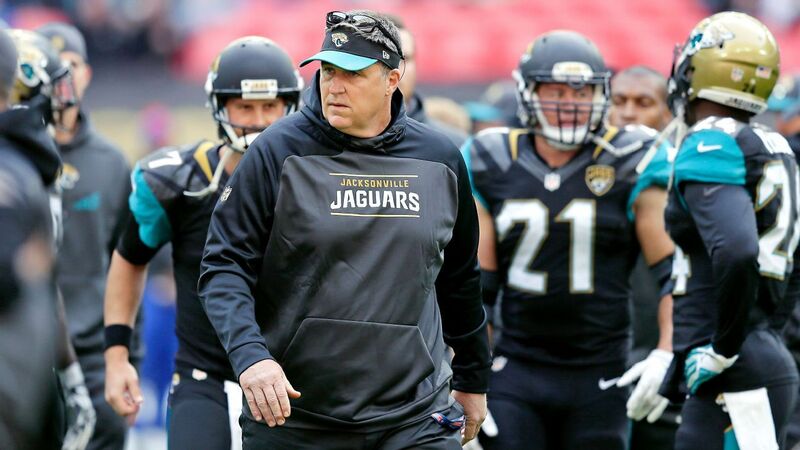 The Jaguars later hired Doug Marrone as an assistant head coach and offensive line coach for the team on the 20th of January 2015. Interestingly, Doug Marrone was later named the interim head coach of the Jacksonville Jaguars on the 19th of December 2016, after former head coach Gus Bradley was fired. Subsequently, on the 9th of January 2017, the interim tag of the Jaguars was removed officially, thus, making Doug Marrone the fifth head coach in the team’s history. On January 7, 2018, Doug led the Jaguars to win their first playoff game, marking their first playoff win in a decade. Doug met his wife Helen through, Colleen O’Brien (the wife of fellow football coach Bill O’Brien). Colleen and Helen were roommates back in school. Helen is from Tennessee and was born Helen Mary Donnely in Murfreesboro on December 31, 1969, to the home of James “Boots” Donnely a former football coach, who for a long time was coaching at the Middle Tennessee State University. She is an attorney and is actively involved in lots of charity work. Doug and Helen have three adorable children together, two daughters named, Madeline Marrone and Annie Maronne and a son named, Mack Marrone. Doug is 6 ft 5 in (1.96 m) tall and weighs 275 lb (125 kg). He also makes $4 million per year as salary. The veteran coach also underwent medical procedures to remove a cancerous mole from his skin. His favourite meal is a bologna and cheese sandwich.